The Vancouver Condo Buzz » From $344,900! New FUSION Surrey Sullivan Heights Townhomes for Sale > 3 Bed (some with dens) Available Now! « Westside Vancouver KILLARNEY RIDGE Homes & Duplexes for Sale! From $344,900! New FUSION Surrey Sullivan Heights Townhomes for Sale > 3 Bed (some with dens) Available Now! FUSION Surrey Townhomes Now Selling! A promise of excellence > The new townhomes at FUSION Surrey are located at 13886 – 62 Avenue Surrey BC and the project will include the release of 56 premium homes for sale. 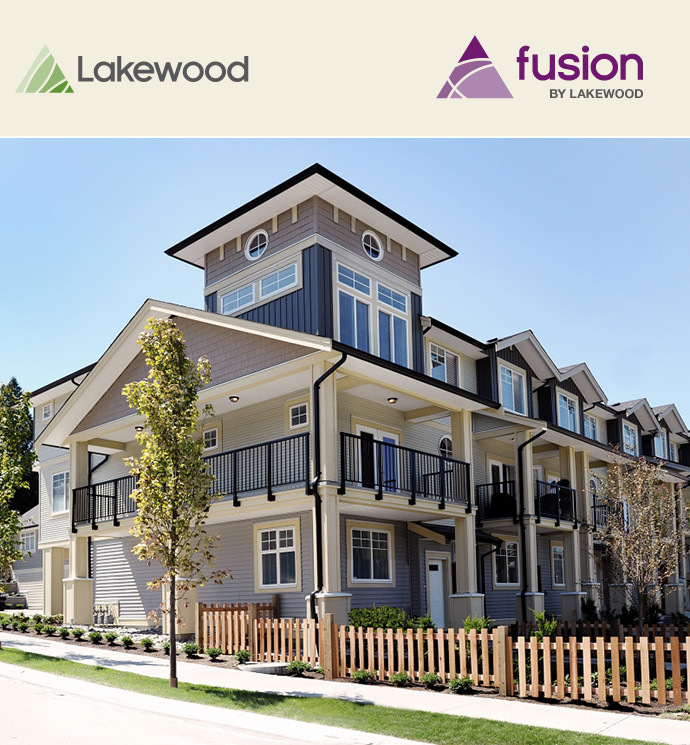 Brought to you by leading developer, Lakewood Homes, Surrey FUSION Townhomes will be located in the heart of Sullivan Heights Surrey district. Right now, you can save up to $18,000 on your new home purchase. 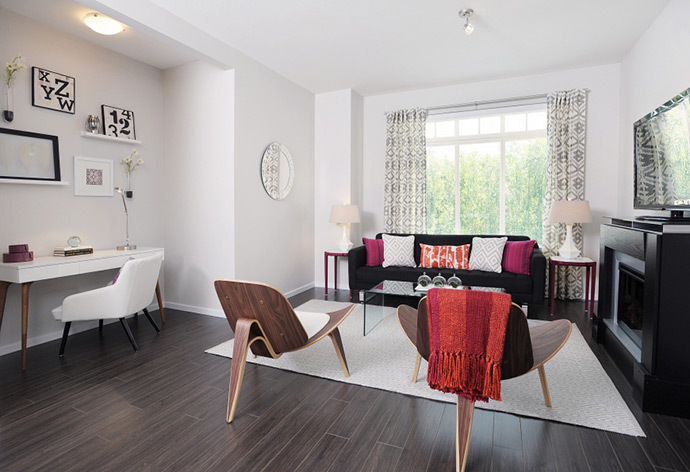 The three bedroom residences start from an amazing $344,900, which is more affordable than most other developments in the Sullivan Heights Surrey neighbourhood. 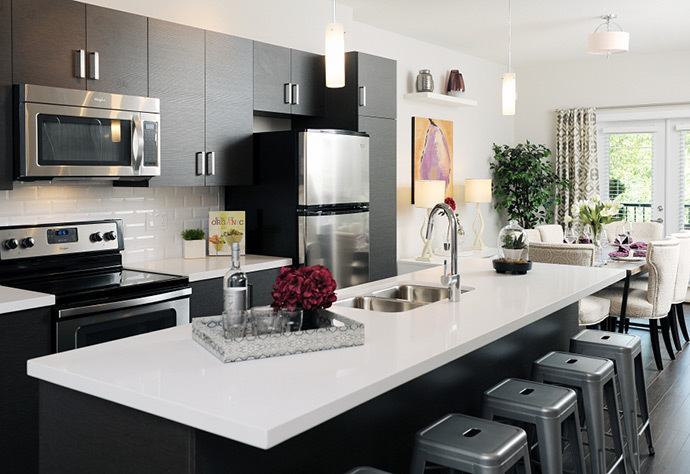 The efficient forced air heating, stainless steel appliances and amenities lounge are all included with your home purchase at the new Surrey FUSION Townhomes by Lakewood Homes. Phase 2 has just been released with five homes just sold last weekend. The sales centre is now open every day except closed on Fridays between the hours of 12 noon to 5pm at 13886 62nd Avenue Surrey BC. You can also visit their online presence at www.liveatfusion.com today for more information. Conveniently located close to great parks and outdoor recreation as well as Guildford Centre, White Rock and major transit routes. Designed by an award winning architect, the new homes here will feature two designer coordinated colour palettes, window blinds and stain resistant/durable carpeting in addition to laminate floors on the main level. There’s a free standing fireplace with an entertainment unit in addition to large windows and nine foot ceiling heights on the main floor. The closets are extra spacious, some with very large closets and all with wire shelving. You’ll also find opulent bathrooms at the new Surrey FUSION townhomes with custom designed cabinetry with slab doors and laminate counters with top mounted sinks. Other bathroom features include soaker tub and ceramic tiled surrounds, ensuite showers with chrome frame glass door and ceramic tiled shower walls and flooring in the main and ensuite bathrooms. The floor plans at the new FUSION Surrey townhomes also have convenient main floor powder rooms. The kitchens at the new FUSION townhouses in Surrey are airy and finely finished with quartz counters, stainless steel undermount double sinks with designer faucet and in sink disposal system, full height ceramic tile backsplash and pendant lights over the kitchen island. There’s also a stainless steel appliance package that is energy efficient. All homes have individually controlled thermostats on the bedroom level, washer and dryer, fifty US gallon hot water tank and high-speed wiring. There’s also cost efficient gas forced air heating system on the ground and main floors and pre wiring for a security alarm system. The exteriors at the new Surrey FUSION townhomes include professional landscaping, private fenced yards, engineered rainscreen building envelope and patios and/or decks for outdoor living. There’s also a mix of tandem garages and single garages + carports depending on the home. All of the new FUSION Surrey townhomes are protected by the Travelers 2/5/10 warranty progam. There are five main floor plans and their variations for prospective home buyers to choose from at this new development. All are draft floorplans and are subject to change at any time by the developer. If you are looking for exact pricing and availability for these floor plans, please don’t hesitate to contact the sales team at FUSION Surrey townhomes today for more details.